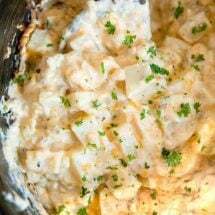 Crockpot Cheesy Potatoes – a delicious side dish with soft and tender chunks of fresh potatoes in a creamy, cheesy sauce. 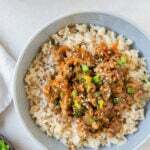 All made in your slow cooker, freeing up oven space for the rest of your meal! I love my slow cooker, but have only ever used it for cooking main dishes, with the exception of the occasional slow cooker dessert. 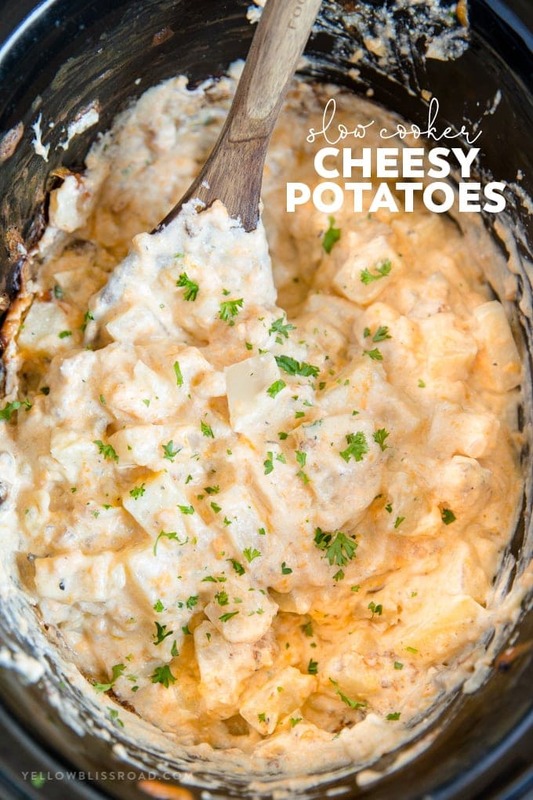 I’ve seen other potato dishes in the slow cooker but I’ve always been skeptical because of how long potatoes can take to cook, or of cooking dairy products. 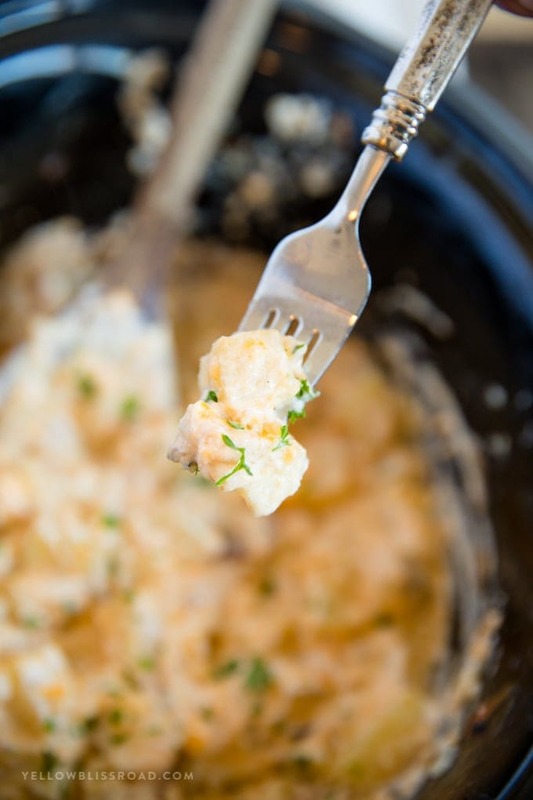 I was pleasantly surprised at how well these cheesy crockpot potatoes turned out! They are super creamy, yet the potatoes hold their shape and stay nice and tender – I am not a fan of mushy potatoes. The cheesy sauce comes together quite nicely, and doesn’t break or curdle like I expected it to. 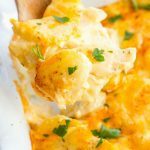 This recipe makes about 6 cups of cheesy potatoes, but can easily be doubled if you’re feeding a crowd. You just want to be sure to stir halfway through to avoid burning along the sides. 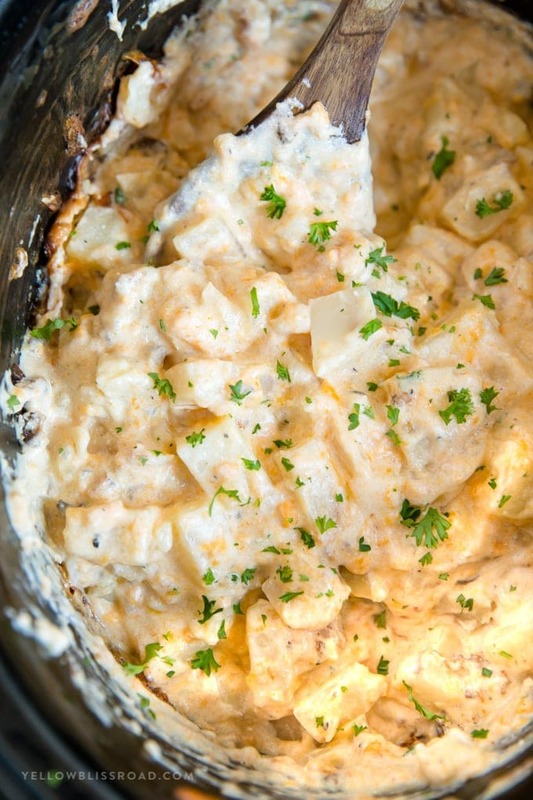 These Crockpot Cheesy Potatoes could not be easier to make. The most time consuming part if just peeling and dicing the potatoes. I personally like to use fresh potatoes, but you could definitely swap them out for a bag of frozen diced potatoes, or even shredded if you want. 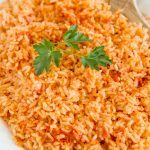 The shredded do tend to get a little mushier and not hold their shape as well, but they do still taste good. Use fresh potatoes. The frozen potatoes tend to be small cuts, so overcooking them can cause them to lose their shape and become mushy and more like mashed potatoes. Same goes for shredded hash brown potatoes. 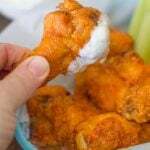 Use fresh cheddar cheese. Please, please don’t buy the bagged shredded cheese. They add a coating to the cheese to help it hold it’s shape in packaging that keeps the cheese from melting properly. And fresh just tastes so much better. If you notice a lot of condensation building on the lid of your slow cooker, take a few paper towels and cover the slow cooker with them, then replace the lid to keep them secure. This will catch the water and keep it out of your sauce. 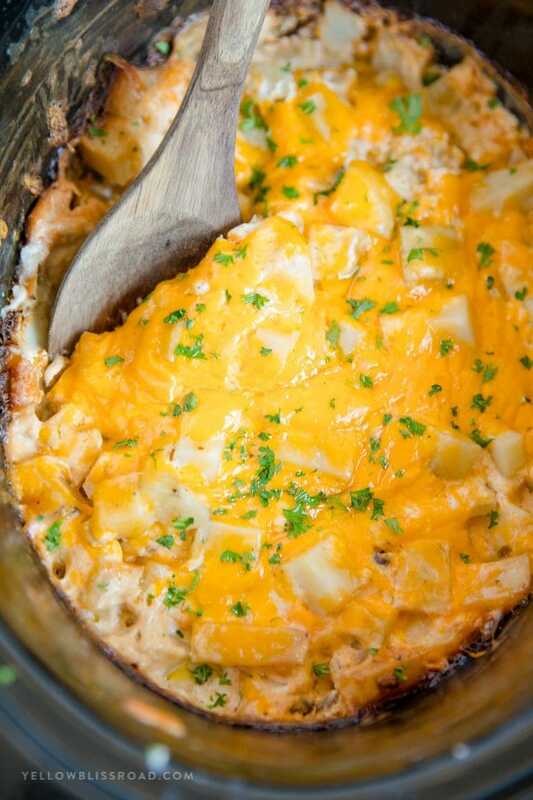 Give these Crockpot Cheesy Potatoes a try the next time you’re craving some real comfort food. I promise you won’t be disappointed! 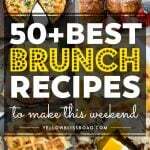 Affiliate links in this post help support the free content you love. Thank you! Peel potatoes and scoop out any imperfections. Dice into bite-sized pieces; about 1/2-inch. (You could also use 4 cups of fresh or frozen and thawed diced or shredded potatoes to save time). Combine ingredients in your slow cooker, reserving 1/2 cup of shredded cheddar cheese, stirring to coat the potatoes completely. Cover and cook on high for 4-5 hours or on low for 8 hours. Stir, then sprinkle on remaining 1/2 cup cheddar cheese. Cover and cook for an additional 15 minutes, or until cheese is melted. Garnish with fresh minced parsley or chives and serve hot. *If keeping warm for additional time, lay a paper towel across the top of the slow cooker and replace the lid to keep it secure. This will catch any condensation. 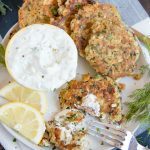 This looks perfect for our Greek Easter dinner this weekend! We don’t have frozen diced potatoes in Greece, so I can’t use our normal family recipe and I was wondering about substituting fresh….thanks for the recipe! This looks really good and I like the use of fresh potatoes. 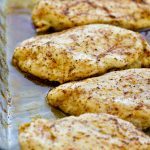 If I double recipe do I cook longer? 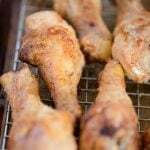 They may require longer to cook, but I’d check them at the recommended time and then each half hour to an hour depending on how firm they still are. Will it hurt if I line the slow cooker with tin foil? Will it make the potatoes cook different? I’m going to make them on the stovetop. I will let you know how it came out. I cut the potatoes much smaller than specified in the recipe. They have been in the slow cooker on HIGH for 7 1/2 hours and are still too firm to eat. My slow cooker is only 2 months old. If they were on high for 8 hours, they may have actually over-cooked and gotten hard that way. Other than that, I’d check the temperature on your slow cooker because there is no way that potatoes wouldn’t cook after being on high for that long. Everyone loved the potatoes, but be warned, if you have to use the “on high for 4-5 hours” version you’re going to have one heck of a mess to clean up. I’ve never spent so much time scrubbing my crock pot. Never again. ? If I don’t have time for the lie and slow version, tgey’re Not getting made. Thank you for your feedback Meg.